Active damped LCL-filter-based inverters have been widely used for grid-connected distributed generation (DG) systems. 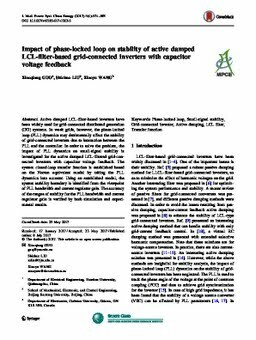 In weak grids, however, the phase-locked loop (PLL) dynamics may detrimentally affect the stability of grid-connected inverters due to interaction between the PLL and the controller. In order to solve the problem, the impact of PLL dynamics on small-signal stability is investigated for the active damped LCL-filtered grid-connected inverters with capacitor voltage feedback. The system closed-loop transfer function is established based on the Norton equivalent model by taking the PLL dynamics into account. Using an established model, the system stability boundary is identified from the viewpoint of PLL bandwidth and current regulator gain. The accuracy of the ranges of stability for the PLL bandwidth and current regulator gain is verified by both simulation and experimental results.